Sarah is the Chief of People, Brand and Culture at brad bell and is responsible for the strategic leadership of brad bell. She is a perpetual student of the Property Services Industry and is a Features Writer and Regular Contributor to Elite Agent Magazine, Australia's premiere real estate journal and winner of Business Magazine of the Year 2016. 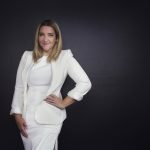 Sarah Bell worked previously as a Researcher, Investigator and Consultant before entering Real Estate in 2009, when marrying James Bell of brad bell saw her fall in love with the business of property too.